2 PCs, 1 Speaker | Life, The Universe and ... Everything! Earlier this year, I got a new PC running Windows for my Flight Sim. I still use my Ubuntu Desktop PC/Server which I use for everything else, but some flight sim some stuff are Windows only and so ... ! Both PCs are wired to my triple monitors, and I can switch monitors over by selecting the appropriate inputs on each monitor. Sound was an issue however, as I only had one set of speakers. At first, I tried connecting the output of the windows PC into my Linux PC's Line Input. This way I could have both PCs output "mixed" together. That didn't turn out too well, as there was a hum from the second PC when connected to the first, and also the on-screen controls not on-screen when I needed them to be. Ordered three panel mount 3.5mm stereo jacks and a 3PDT Switch - 3 Pole Dual Throw switch. This switches a set of two 3 pin inputs to a 3 pin output. The three pins are used for the audio ground, left and right channel respectively. 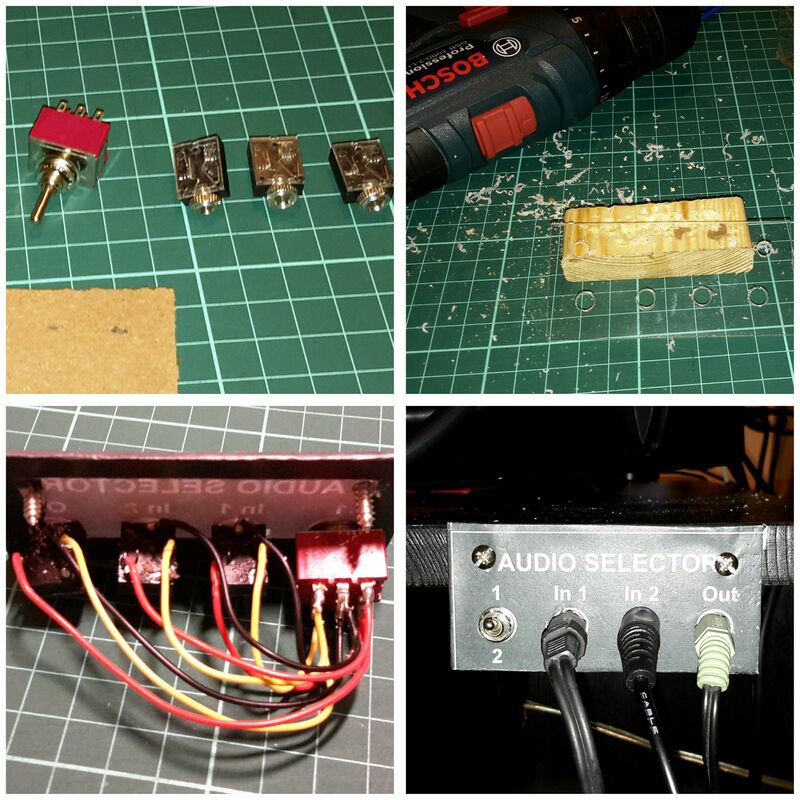 Drilled out holes for the jacks, switch and mounting screws on a piece of 1 mm thick acrylic. Mounted the panel to the side of my desk. Now I can switch audio between the two PCs with the flick of a switch.